At Website Wizards we believe in providing high quality design work that incorporates industry current platforms and coding practices matched with our near real-time responses to your project updates and changes. Unlike many in the industry, we believe in ethical search engine optimization, coding practices and deliver designs that match your profession, institution or product line. Our designers are experienced at working one-on-one with clients who have a wide range of experience with web development from well versed to no experience at all. We take the time to help you grasp the wider market of websites and digital visitor to client conversion. We offer full service website development solutions for all major web related platforms from the most basic to complex Ecommerce. From fully customized templates to custom coding, we have the staff available and ready to exceed expectations. Call or email any time for a hassle-free consultation on your web development project. We are always happy to offer free advice. One point of contact for all your digital business related needs. Content writing assistance with keyword embedding to boost websites keyword values. 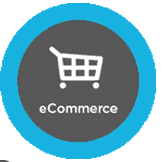 Websites designed to list and sell products online complete with user accounts, shopping carts and payment gateways. Expandable websites built on WordPress offering easy management, blogging and other website functionality. Websites designed around your business branding, coloring, logo and profession that delivers results. Complete website updating from security, basic adjustments or complete overhaul. Please see the below for information on the two primary paths to setting up your next website and determine which is right for you. If you have questions on this or any other aspect to your website design needs, please reach out to us at any time. Website templates are fully compiled websites that are packaged and ready to be edited for individual use. They can be fully customized to meet individual needs and are coded on all major website platforms. A website template has all the basic coding completed which makes it a far easier and affordable approach to installing a website. When contracting us to setup and install a website template, we start by working with you to find the perfect platform and website that will fit all your business needs. We work with the industry leaders in template designs and have a well-established relationship with them going back over ten years. We know their templates inside and out and have contract support with them in case problems arise. There are hundreds of thousands of website templates which allow for complete customizing of the code, colors, images and formatting of the website. Over 90% of our website building work comes from customers who choose to work with a template in order to save a good deal of money. Website templates have a onetime fee to buy the template and are then good for the lifetime of your business or website. There is no lease or rental agreement, once you buy the template it becomes yours to edit and use for as long as you like. Website templates come with a demo feature which allows you to try out the overall look and feel of the website before committing to buying it which is an advantage to having someone custom build a website. The demo is in effect the actual website in all aspect but missing your data and images. This gives you a complete understanding of how the website will function on all levels. While a custom website can offer the most exclusive and catered to fit of all website designs it can also be the most costly depending on your needs and various services you plan to have. Custom website creation is a must have for large businesses who need massive employee or client interaction via the website or those who seek to have their website interact with various servers within the business itself such as SQL databases or others. When it comes to websites, custom designs also take the greatest amount of time and interaction with the person or department requesting the website to be built. Throughout the years we have designed websites only about 10% of our client base has asked for a custom design however the end results can be greatly rewarding for those needing application specific processing or heightened security in cases of financial banking or personal I.D. containing websites. Pay nothing down to start your website design project. Upon contact, we will start by gathering a detailed understanding about your business and website design requirements. If you are not completely sure what exactly you have in mind, not a problem. We can work with you to fill in the details or if you like, we can head the design project for you from start to finish. Once we have a solid understanding of your needs will will supply you with a detailed quote for the design and work. If it’s within your budget, we will start a design mock-up. Once we have a basic outline of how you want the project handled along with any design ideas we will start a mock-up of a website with basic functionality and page content for you to review. We work with you to make edits and changes to the design until the overall look and feel of the website is to your liking. After the you have had time to request changes and begin to see an overall view of the website with your images and content we will have you inspect the website and decide for yourself if our design is worth moving forward with. Once you feel comfortable that our design will meet or exceeded your expectations we will work with you to arrange a partial first payment on your new website. The payment amount will be 50% of the total quote for your website project. After partial payment we continue working one-on-one with you at every step of your website design project. From answering basic questions to performing edits, formatting changes and uploading your content. We strive to design a site that not only looks professional but performs well with search engines. Nearing the end of your project we will ask for the final payment of 50% to be made on your project. After payment is made, we continue with finalizing details on your project and any last-minute changes or revisions you want to make. This will include us performing a final code inspection along with SEO adjustments and fine-tuning. After we are sure everything is in working order and you approve, we email you easy to use documents which detail any relevant web management information you will need. In the case of websites with a blog, the documents will give you the steps needed to add to the blog and make adjustments as needed. For online store websites, the documents detail how to upload new products and set pricing along with your payment gateways. I don't currently have a website, can I still use a template ? Yes website templates are complete functioning websites so you do not need a website already in order to use a template. They offer the back end work already completed which saves time and money on the overall project. We will need to know the type of business you run, access to your website host provider to upload the website and any images and content you want added to the website. If you do not have some of these things, not a problem, let us know and we can work with you to get any required information ready for your new website. I have a website already, will it go down while you work on the new website ? No, we work on the website template on our servers and then once everything is complete we will upload it onto your server at which point your website will change from the old site to the new. The change from old to new website takes only a matter of minutes for most websites so there will be no major impact to your clients or website traffic. I do not have a website or a web host, can you provide one ? If you currently have no website host, we are offer hosting plans and domain names and will walk you through the steps needed to set this up. Please see our domain names & hosting page for additional information. Can I change to different templates or is it a one time change ? Yes at any time you can change the website to a new template however additional charges apply. For websites such as WordPress sites, you can change the overall look and feel of the website by selecting a new theme. Can I order other services from you to add to the website template like SEO work ? Yes, please let us know any work you wish to have performed at the time of initial contact and we will bundle a package for you at a discounted price. Will other people have my same template ? Although it is possible others can buy the same template, it will be unnoticeable since each website template is custom configured to the individual clients needs with their content, colors, formatting and images.